Meadow buttercup is an erect perennial, native in grassland especially on damp and calcareous soils. It is recorded up to 4,000 ft in Britain. It is not markedly a calcicole or calcifuge being abundant on both alkaline alluvial meadows, base rich clays and on the acid peat of mountain uplands. It is characteristically found on grazed and mown grassland. Meadow buttercup is a serious weed of old permanent grassland and its abundance is considered an index of the age of the pasture. It prefers intermediate conditions of moisture and drainage and is found on the slope of the ridges on ridge and furrow grassland. It is not tolerant of trampling but can survive frequent cutting. It is a very variable species with several sub-species and varieties but only ssp. acris is native in Britain. A white flowered form is sometimes found. Much of the variation is due to differences in growing conditions but some ecotypes have developed to suit particular habitats. Some populations have developed resistance to the herbicide MCPA. Cattle usually avoid the plant due to its high ranunculin content. Meadow buttercup can cause inflammation of the digestive system in cattle if eaten fresh but is okay when dried in hay. Meadow buttercup flowers from May to July and sometimes longer depending on the locality in the UK. Some populations are self-sterile. The flowers are visited by a number of pollinating insects. Flowering lasts for 2 months, after which most seeds have ripened and shed. The first fruits appear in mid-June and peak fruiting is in mid-August. Each flower head contain 30 seeds. Seed numbers per plant normally range from 200 to 1,000 but a large plant may have 22,000 seeds. Seedling emergence is said to occur in autumn and spring but some research suggests that emergence is from January to April with no seedlings emerging at other times of year. Seedlings tend to occur in clumps or patches and there is heavy mortality at the seedling stage. Meadow buttercup does not establish well from seed in dry soils. After flowering, the summer leaves die and meadow buttercup passes the winter as a rosette of small leaves that appear unaffected by frost. The plant has a short creeping rhizome that is relatively persistent. The rhizome is dark brown to black with adventitious roots and the remains of the old leaf bases. It is densely packed with starch and contains the glucoside ranunculin. In the autumn a small branch of the rhizome produces a new vegetative shoot close to the parent. The connection decays as the plant develops resulting in a tightly clumped colony of individual plants over time. In February-March there is a rapid formation of new leaves and the starch reserves disappear from the rhizome. The rhizome may rot away after this and none of the original rhizomes may remain by flowering time. Meadow buttercup employs both seed and vegetative reproduction but the latter is restricted by the shortness of the rhizomes. It flowers at a time when most meadows are mown so it cannot rely on seed for persistence. Few buried seeds have been recorded in soils under pasture. Seeds in dry-storage have remained viable for 4 years. Plants in pasture have a half-life of 3 years. There is no obvious dispersal mechanism and seeds tend to fall around the parent plant. Birds eat the seed but it is unlikely that any seeds remain viable after digestion. The seeds are also predated by voles and mice. In arable land, frequent and thorough cultivation is important for the control of meadow buttercup. In pasture, cutting will prevent meadow buttercup seeding. It survives frequent cutting for hay, although this does reduce plant vigour. 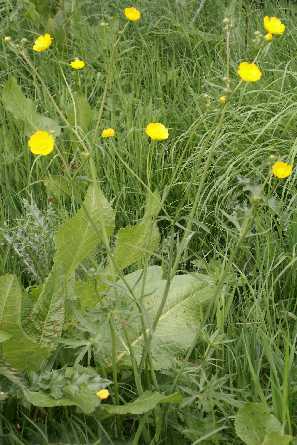 Meadow buttercup is avoided by grazing animals due to the acrid tasting sap. Its presence reduces the productivity of pasture.